Arola is a Mediterranean restaurant located in Nanjing, Jiangsu province and featured by Michelin starred Chef Sergi Arola. In this restaurant the prestigious chef - awarded with two Michelin stars for his restaurant in Madrid - presents a current and modern version of Mediterranean cuisine, reinterpreting traditional flavors in an imaginative proposal of tapas and dishes. At the end of March the first year anniversary of the new jewel birth took place in Nanjing. 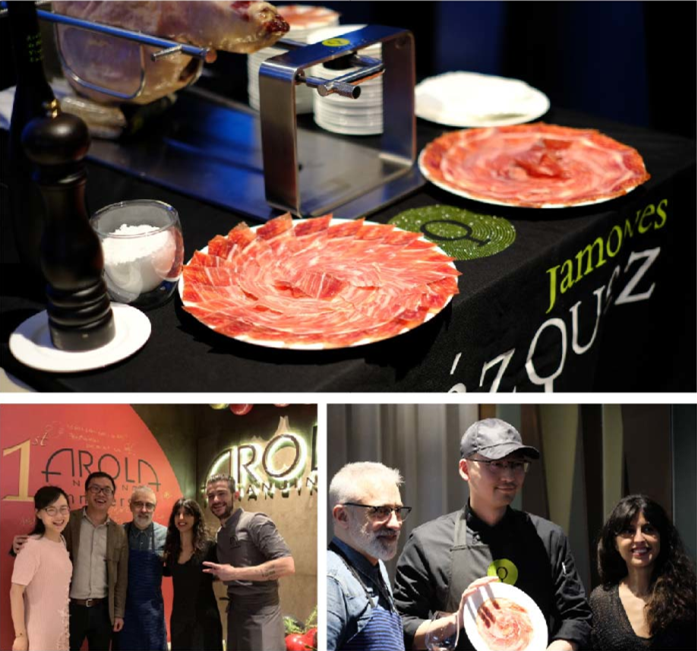 It was an unforgettable dinner, Juerui Industry along with its premium Jamones Blazquez brand from Guijuelo was invited to the celebration. Juerui Industry wanted to participate and support the special occasion with the sponsorship of the carving show. The Michelin starred Chef Sergi Arola, Daria and Guiseppe worked together to create a special menu for such significant evening. They showed their gratitude to Juerui Industry for the help provided in the path to their success and being a confident partner since the very beginning.